What's up, you guys?! So I kinda took a day off to rest and relax, but now that I'm a little bit more rejuvenated than before, how about we look at more robots? 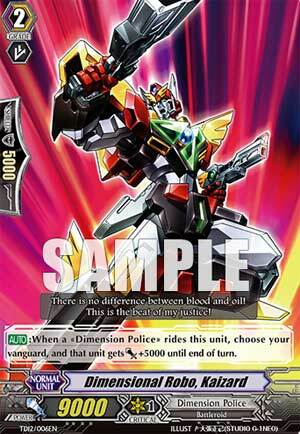 [AUTO]:When a «Dimension Police» rides this unit, choose your vanguard, and that unit gets [Power]+5000 until end of turn. ...this is a rather interesting card as, depending on the stipulation, can trigger the new Vanguard's condition with its Ride effect. As for the card itself, it's a pretty solid 9,000 Power Grade 2 with a rather interesting effect; when this is the Vanguard and you Ride into something different, the new Vanguard gets an extra 5,000 Power for the turn. Granted, 5,000 Power doesn't sound very much on paper, but seeing how there are cards out there that gain some kind of a buff when they hit a certain plateau of Power, this can become a pseudo Break Ride because of the bonus. For example, if you Ride into Enigman Rain, you get her restanding effect. Using this with the much lesser used Enigman Cyclone allows you to retire an opponent's rear-guard with this Ride, but the one that most people are going to abuse this Ride with is with either Enigman Storm or the soon-to-be extremely popularly seen Daiyusha series, and the latter of which can be pulled off a lot easier especially with Goyusha. The only drawback I can think about this card is that you can only get this effect while it's the Vanguard and is a 9,000 vanilla any other time, but the way I look at this card, it isn't made to be a card to rely on but more of a combo card to go into bigger and stronger attacks. Overall, if you have room in your deck for this card, give it a shot because it definitely deserves a chance. Next up, we have a card unique to the Trial Deck for D-Robos, Kaizard. When you ride a unit on top of him, that unit gets 5k until the end of the turn. Okay, so what we have is an insta-live Daiyusha when you ride it. Okay, I suppose, as filler goes. These days, both Daidragon and Daifighter are pretty much staples because of the meta's state of things, so it's up to you what goes in the rest of the Grade 2 slots. I guess there's no harm to using him for now. But once we get the promo card Dimensional Robo Kaiser Greater...oh boy, the shenanigans with him in Crazy Diamond build...but a man can dream. For now, he's boring, but practical.